Laimoon.com is forming a strong relationship with Potential.com and we are contributing by providing strong relevant content, as seen below. Talent development for SMEs is tremendously challenging, as the majority of SMEs do not have the capacity to develop top talent. As an SME, if you do have the time to identify, develop and nurture talent to full potential, your company is on the right growth path. Whether you do have or lack the capacity to foster talent, importing talent is a requirement for companies of all sizes. Winning the war for talent is particularly important for SMEs, as just one wrong hire can have immense consequences. When hiring in your fast growing company, it is a time to step out of your comfort zone. While hiring through personal networks is an acceptable place to start, the chances are small you will be referred unknown top talent. A more exhaustive search is required. This search should include job ad and database searches online, such as the free database search on Laimoon.com. Even going so far as to engage recruiters on a contingency basis can pay dividends when seeking top talent. Once you have started the recruitment process and have potential candidates to interview, it is important to keep in mind these 3 tips. You need a compelling value proposition – What is the unique selling point that sets your company above all the others? Top talent is motivated beyond a paycheck and need to understand the value being created by your company is truly helping people. You need to be hiring ‘Do-ers’ – What are Do-ers? A do-er is a future manager or director that can draw from experience to bring ‘big wins’ for the company. Do-ers are people thrive on going out and doing the hard work required of them, while one day developing into potential leaders. As a focused business owner, one day you will be lucky enough to have talent development programs within your organization. Until then, hiring top talent who can one day turn into your future leaders is a great method for success. Keep one eye to the future and one eye to accomplishing today’s task and you will set the stage for strong talent development in your organization. Back when this social media thing was still new, I was building awareness by performing social media trainings. I would work alone or with my entrepreneurial friend Christine Springer and we would discuss how to be more effective and obtain business from social media efforts. I think I was very effective and well received by the different audiences because I would always try and tie these marketing efforts to the bottom line. 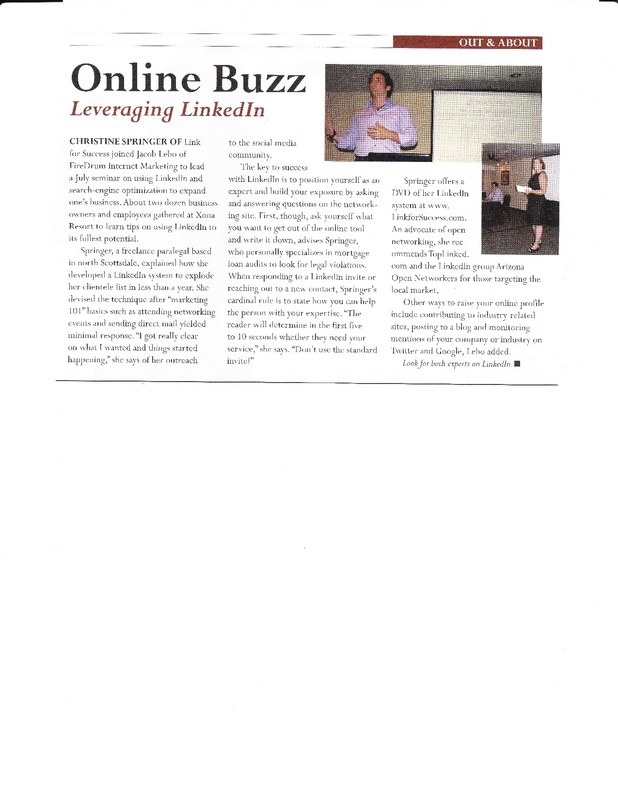 While I wasn’t always getting press coverage of trainings, Christine was smart enough to save the clipping from a training we did together on Leveraging LinkedIn back in 2008 or 2009. You can watch the first part here. I was recently published in Reseller Middle East where I discussed valuing your sales staff. There are stark differences between the Middle East & the US regarding sales. I attempt to shine some light on how MENA managers can value their sales staff similar to how it works in the west. You can find it on the ResellerME Online Magazine-Page 51. Or read the unedited article below. All recruiters and employers face common problems, yet here in the Middle East, and particularly in IT these problems all are noticeably amplified. Overall the perception is there are not enough qualified candidates – however common problems such under prepared, under educated or already gainfully employed are consistently mentioned. As a result many hours and much hard work go into the recruitment of the staff of your company. Despite this hypercompetitive marketplace rife with problems, and sincere intention of attracting the top talent the recruitment, development and retention for the position of sales is often overlooked. Perhaps another article for another time, would be due if I have to tell you why skimping on the hiring of sales people is a bad idea. Instead addressing the larger prevailing attitude throughout the region that the sales profession is viewed a more of a stepping-stone to a ‘better’ position does more to help us understand the problem of attracting and developing top IT sales talent. While both job seekers and employers foster this misperception it causes pain on both sides of the equation. As a virtue of being treated as second-class employees sales professionals are always on the hunt for their next higher paying job, ready to jump ship with an increase of a few hundred dirhams at a moments notice. Employers are aware of this and thus treat sales people as a flight risk, under compensating, micromanaging, and fostering the atmosphere of irreplaceability. This results in a vicious cycle of disloyalty where by sales ‘professionals’ hop from company to company acting as hired guns for the next highest bidder. Since this retention of top sales talent starts with recruitment, how do you attract the top talent? Simply put treating your employees well. A more complicated answer would be a larger organizational change, fostering an environment that is view upon as a great place to work. Since we as humans spend the better part of our days and particularly our lives at work we look for a great and dare I say fun place to work. But what makes a great place to work and how do I attract great people to work here? When advertising and recruiting for the position it is ok to use unique incentive structures to attract top talent, and just like offering value added services, this will distinguish your business in the market place. Besides straight monetary compensation here are some other incentive ideas to attract top talent, particularly sales talent. Emphasis on a diverse skill set – Talented people appreciate the opportunity to perform a wide array of tasks and responsibilities. Proclaiming this to be the case when recruiting and hiring will drive you top talent. Offering training and continuing education – Along with a diverse skill set, top talent needs to be driven to excel. Mastery of concepts and technical aspects will contribute to employees personal and professional growth as well as creating more knowledgeable employees for your business. Laying out a clear career path – Business is not expected to grow without a clear business plan, why should your employees be any different? Laying out clear career paths assist in showing employees how they must perform to get to where they want to be. Unfortunately workers can become comfortable at their jobs figuring out how to do the least amount of work, but still impress their bosses. This is why unique and goal driven compensation can enable employees to perform not only for your business, but also for themselves. There are many challenges in sales in the MENA region. Only when perceptions change and a few forward thinking companies start to change environments will then the market change and sales professionals will then soon follow. This is a blog post I did while I worked at FireDrum Internet Marketing. The tone is fairly lighthearted but I think hits something interesting, using direct mail to increase effectiveness and digital marketing efforts. This morning I was listening to the Diane Rehm show after leaving an appointment. Her guest was John (Jack) Potter, U.S. Postmaster General. Mr. Potter had the unfortunate task of defending to Diane and her listeners why the U.S. Postal Service was still relevant and how to fix the acute financial crisis that was affecting it. While there is a very real financial crisis effecting the health of the postal service, it was a very in depth and extremely informative interview. There was one interesting perception of Postmaster General Potter’s that really stayed with me. Stayed with me so much I actually had to tweet about it. Direct Mail and Email Marketing | FireDrum Internet Marketing Blog.